Adjust Magento default checkout to your clients' needs: add new registration & checkout fields, show different options to different customer groups or display extra fields on specific products only. Adjust Magento default checkout to your clients’ needs: add new registration & checkout fields, show different options to different customer groups or display extra fields on specific products only. 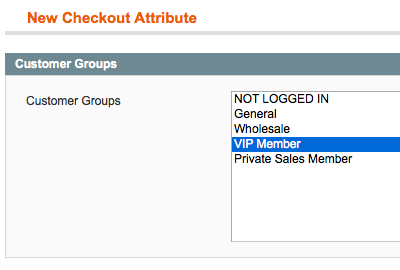 Why Use Magento Custom Checkout Fields? 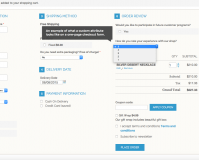 Improve user experience with personalized checkout. Collect useful marketing and customer data at registration/checkout. Compatible with responsive web design (RWD). The Magento Checkout Fields extension is also available for Magento 2.x.x. Finding a reliable customer data channel is critical for any online business owner, especially ecommerce. Thanks to the module, merchants can get the required information from the customers themselves, meaning its high reliability, relevance and trustworthiness. Customer data is the basis for an effective ecommerce decision-making. Utilizing the extension, Magento store owners can start collecting the exact information they need directly from buyers and use it further to create targeted marketing campaigns and adjust positioning and segmentation strategies, driving higher revenue and customer loyalty. With convenient checkout editing tools, merchants have the freedom to tailor the default checkout to not only their unique requirements, but also customers’ expectations. Adding new fields in a convenient format, it will be easy and quick for buyers to fill in the required information, which will increase the chances of them placing an order and completing the checkout. 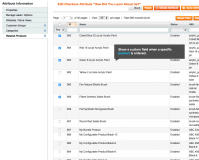 Add new fields to multi-address or one-page checkout pages. 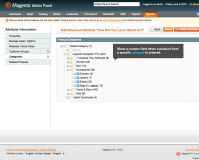 Add new fields to Magento customer registration page. Use these input types: Text Field, Text Area, Date, Yes/No, Multiple Select, Dropdown, Checkbox, Radio Button. Add a default “Please Select” field for dropdown that will force customers to choose a different value. Choose Store Views (per Website) where custom fields should be displayed. 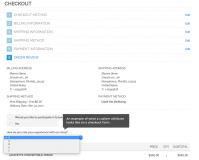 Display custom fields in corresponding steps at checkout. Show extra fields only to specific Customer Groups. Show extra fields only when a specific product is ordered. Show extra fields when a product from a specific category is ordered. Add text to checkout steps without adding new fields. Use basic HTML in a text-type custom block. Edit custom data without creating a new Order. Edit the name of the block that contains custom Order data. 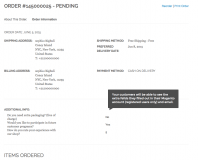 Edit the custom fields data text style for the order confirmation e-mail. Add custom fields to the Order grid (except for Date). Filter Orders by custom fields data (except for Date). Sort Orders by custom fields data (except for Date, checkbox and multiselect). Use the extension when an Order is created/edited via the admin panel. Display customer-added info at Order details page in both the admin area and the customer account (for registered users). Display customer-added info in the Shipment PDF. Show custom fields at Invoice Overview and Print Invoice in the admin panel. Add the info from custom fields to the Order confirmation e-mail (when a customer uses standard Magento payment gateways, including PayPal). Add the info from the custom fields to the Recurring Profile. Choose to pre-fill information from custom registration fields into corresponding custom checkout fields. Support for SOAP API v1, v2 and XML API. Support for SOAP API v1, v2 WS-I (for Magento CE 1.7.0.0 only). Compatible with all kinds of PayPal payment methods including PayPal Pay Flow Pro. Compatible with Sage Pay and Epay payment gateways when respective modules are installed. Support for these payment methods: Saved CC, Check / Money Order, Purchase Order, Authorize.net, Cash on Delivery. Support for these shipping methods: Table Rate, Flat Rate, Free Shipping, Fedex, DHL, UPS, USPS. Compatible with Aitoc’s Configurable Checkout extension for Magento. Compatible with One-Page Checkout Booster by Aitoc. Compatible with PowerSync Salesforce integration (Basic and Professional). Not compatible with Custom Registration Fields but contains most of its functionality. 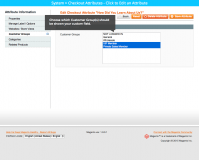 One Step Checkout Magento extension – all-in one checkout solution. Add or remove checkout fields, remove unnecessary checkout steps. 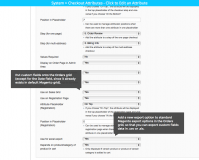 One Page checkout Magento plugin – let customers complete the checkout on one page. Magento Custom Registration Fields extension – add any custom field to customer registration form. 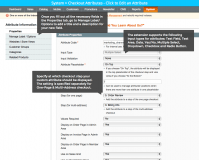 Configurable Checkout plugin for Magento – remove unwanted checkout steps. + Added compatibility with Magento CE 1.9.3.3, 1.9.3.4 / SUPEE-9767 v.2 patch. 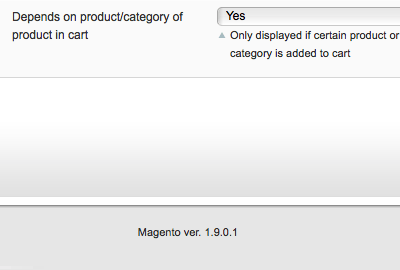 + The extension is compatible with Magento CE 1.9.3.1 / SUPEE-8788 patch. * Fixed the problem with not passing to the second step when checkout with multiple addresses. + Display customer-added info in the Shipment PDF. * Fixed the problem with 404 on Export: EXCEL Checkoutfields. * Fixed the problem with 'CHANGE' link for custom data edition in order view. * Fixed an issue with the custom field from order review step of checkout is missing in order details when Authorize.net Direct Post payment method is used. * Issue with the checkout attributes are not passed to the recurring profile and orders generated through it is fixed. * Issue with completing multishipping checkout on Magento CE 1.8+ is fixed. * Issue with requests using api v2 don't return CFM custom fields is fixed. * Error requesting invoices using Magento Soap API is fixed. * Fatal error when placing order from admin panel is fixed. * Compatibility fix with AITOC Configurable Checkout extension. * PayPal Express Checkout Payflow Pro Edition issue is fixed. * A 'return' is added to Aitoc_Aitcheckoutfields_Model_Rewrite_CoreEmailTemplate class sendTransactional function. * Bug with custom fields addition to the emails using Payflow is fixed. * An error when creating order because of the table with prefix doesn't exist is fixed. + Admin can add label and value of custom field to Plain text order confirmation email. + Events on data saving and order creation are added. * Issues with order cretion and order editing from backend are fixed. * Incompatibility issue with Configurable Checkout extension with incorrect display of printed invoices is fixed. * Issue for CE 1.4.1 - 1.6.2.0 with order for Paypal Pro payment method is fixed. + Supports SOAP API v1, v2 WS-I (for Magento CE 1.7.0.0 only). * Ajax issue with order can't be placed when text field is enabled is fixed. 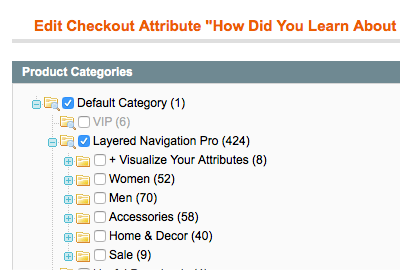 + Displays custom fields in the corresponding steps of the checkout progress bar. * Fixed the issue when recurring payment method is used. * Issue with create order from admin panel is fixed. + Adds the info from the custom fields to the the Recurring Profile. * Compatibility issue with SagePay (Ebizmarts_SagePaySuite) is fixed. * Admin area bugs are fixed. * CFM and One page checkout booster compatibility bug is fixed. * Issues with custom values when the order is created by admin are fixed. * xss attack security bugs are fixed. + Compatible with all kinds of Paypal payment methods including PayPal PayFlow Pro. * Sage Pay issue is fixed. * Conflict with the One-Page Checkout Booster is fixed. 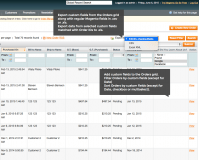 + Enables Admin to configure which custom fields are displayed for specific customer groups. * Check box and Multiple Select sorting on the orders grid issue is fixed. + Data import from the Custom Registration Fields extension is added. * Issue with module vulnerability for xss attack is fixed. * Issue with php 5.3.x configuration is fixed. * Issue with PaypalExpressCheckout is fixed. + Allows to export to xls the data from selected custom fields matched with order IDs. + Displays custom fields at the invoice overview and print invoice in the admin panel. + Enables Admin to edit the custom fields data text style in the order confirmation e-mail. + Compatible with Magento 1.4.2. + Compatible with Sagepay and Epay payment gateways, when respective modules are installed. + SOAP v1, v2 support has been added. * Bug with Paypal and custom fields in order confirmation e-mails is fixed. + Allows to automatically fill out the information from the custom registration fields into the same custom checkout fields. +The extension is compatible with Magento 1.4.1.x. + Ability to add default “Please Select” field for dropdown and multi-select fields, which will force to choose a different value. * Saving options of attributes. Great module, installation was smooth, no issues, no hiccups. Had to do some modifications to one of the files, support was helpful to point me in the right direction. I believe this extension is one of the most important modules on my store. It helped to configure my checkout to add all necessary for my country required fields and use them to filter orders in the back-end. You are rock! Keep up! I have been using this extension since 2011. I'm a developer and I'm happy to see that aitoc still improves this extension. Support from the guys are always great and professional. It's cool to see that their support manager are not just like a translator between you and their developers, but they have good tech skills. Thank you! Excellent Module and Support. I bought this module and had a couple of hiccups. The support team were first class when sorting everything out (And the fix is being included in the next patch of the module!) I would highly recommend this module! The best extension I've come across. Simple but extensive documentation alongside good code. My typical experience with plugins is that I have to dabble a little, this worked perfectly even on an old installation of Magento (1.4.2) that I didn't configure. The customer support was very helpful. This extension saved us a lot of additional programming costs and did exactly what we needed it to. We've used this extension before on our old site and then again on the whole site makeover. There was a conflict with another extension we had installed. The AITOC support team worked wonders in finding a solution to the problem with always prompt and polite responses. Great extension, even better support staff. Great plugin, does exactly what what it says. Support fantastic, Aitoc went in and got it working with another third party plugin within 12 hours at no extra charge! Brilliant! Thank you very much! Works great with other extensions. I used a different extension first and it broke the checkout page by taking over the templates and conflicting with other extensions. This works perfectly with the other checkout extensions I'm using. Support queries were also answered quickly and perfectly. There is something that has to be said first for the support for this extension - and it sum up with one word - Wow! Absolutely brilliant support, helpful and friendly and fast. Would I recommend this module? Definitely I would. I tested it with Magento 1.6 and I can confirm that it works really well! And more than anything - THE DEVELOPER'S SUPPORT IS INCREDIBLE! Really! I read a lot of review here where people had mentioned the same thing and all of those great reviews were confirmed when I contacted them for support. They are prompt in replying and most important they are genuinely try to help you out with your questions in a very polite manner. And yes they include great reports via export. This module is absolute must for any serious business online. Collecting extra information from customers nowadays gives shop owners tool to manage their marketing endeavors. Frankly I was surprised with flexibility of this module! Really was. Amazing... You can spend hours to do own fields but still not even close to what this module does. Amazing work by developers but again it comes to one thing - support. I frankly expected a bit of bumpy support as I knew magento site I was installing the module, had few issues. And to my surprise - t hey worked out without bothering me with questions. OMG this was so great experience. May be after while I got used to be brushed off when problems occurs and left alone to debug. To my surprise.......all support and installation was easy on me...I bet not easy on support team I am sure of it. Will recommend this module and support of AITOC to anyone? BIG YES!!! !........if you consider extra fields for your check out - this is the best ever module! worth every single penny you spend!!!!!!!!!!!!!!! THANK YOU SO MUCH! Not only do their extensions rock and save a ton of time and money, the support with this company is unbeatable. They were able to do customization to their extensions, and to extensions that wasn't even their for a small amount of money compared to the job done, and in a short amount of time that would have taken me days or weeks of banging my head up against the wall to complete. These guys have a very knowledgeable staff to work closely with you and make sure your site will stay up and running. This extension saved me a ton of money. I was pricing out custom programming to do the same thing and it was going to be super expensive. I can't believe I found the perfect extensions. Thanks! The only con we found is that even though the fields are stored in Magento there is no way to report on the fields. Example: we ask the customer where they heard about us. The answer shows up on the order information but there is no tool to generate a report for that captured data. Response from AITOC: Thank you for your feedback. You may get Smart Reports (http://www.aitoc.com/en/smart_reports.html) extension along with 1 hour of support time, and we'll create the ability to generate this report for you. Thanks for the support I needed help with exporting custom fields data, and AITOC pointed me in the correct direction. Thanks guys! This product works exactly as described, I used the back and front end demos on the website before purchasing and now having it installed on my website it works the same. They provide a great step by step walkthrough of installing the program that made the job even easier. Does what is promised! We bought this extension together with Configurable Checkout, also from AITOC. Using these two, so much can be adjusted to the checkout procedure. The detailed description is very accurate in describing what functions the module has. And everything works just that fine. The module looks very professional. Installation and configuration are easy. Furthermore excellent support is provided when there are any questions. They respond very quickly and the answer is as accurate as possible. Checkout fields manager is a must have extension My client wants to add additional information that the customer needs to select or input in onepage checkout page. The checkout fields manager fulfills this requirement and not just that, whatever the customer select or input, it will be available in the customer account as well as in the back-end admin. This has saved me a lot of customization time and efforts. Now I am looking to make the checkout even simpler with Aitoc configurable checkout which allows me to hide some fields that are not relevant for the customer. Keep making awesome extensions! Very useful extension, works like we expected. Excellent support. Highly recommended! Great extension and amazing support ! Excellent support our question was answered and solved within an hour! The product does exactly what the description said, it's highly configurable and easy to use. Also the support is really good, I asked for WS-I compliance support for SOAP v2 and in one day they've written the code and explained to me in details how to use it into my code. I'm a satisfied customer and surely will buy more products in the future! Its a very useful and must have Magento extension. And their support is impeccable. I highly recommend this extension and AITOC. Had a few issues with install but support was very good. Nice extension very easy to use. Recommended. This mod helped not only us but our customers. There were specific things customers needed to tell us about their order. 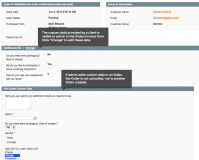 We added an order comments box and made it viewable in the sales grid. Now we can see any special instructions immediately. We actually hired the AITOC team to add some special customization to this for us. 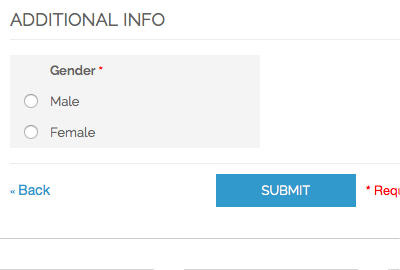 We needed to be able to call these fields in the transactional emails associated with the order. They quickly did this for us and now customers see the PO Reference in their shipment email. I highly recommend. Nice extension. Very well documented so that you know in advance what you will be getting and it does exactly what it claims to do. If you get professional installation you also get speedy troubleshooting too. Excellent service. Seemed really awesome at first, but when you realize that the information does not print on the invoice, reports, or export in any way, the value of this module drops severely. We added an "order comments" field at checkout- but because our shipper prints all the invoices at one time, he would only ever see the comments if he clicked each order individually in the back end, which would be way too time-taking, so the customers' comments never actually reach the shipping department (so why have comments?). 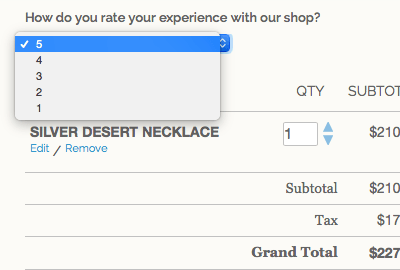 Also we added a "tell us how you found us" field, but clicking through each order to find the response is very tedious. Good start on this extension but definitely needs to add some reporting functionality for it to be really useful. UPDATE FROM AITOC: Thank you for your feedback! Many of the issues are now fixed, please refer to the changelog. Really great tool. You will have return on investment. After I installed i reduced support calls from customer also improved my sales. I got instant response for support from AITOC as well. Very very thanks to AITOC! Awesome! Awesome! Awesome! Highly recommended! I had been looking for a solution to add a simple comment field to checkout for days when I ran across this plugin. My customized checkout caused some challenges. But AITOC's superior support helped me overcome that hurdle in less than 24 hours. Great work guys! Keep up the good work. PROS: Easy to install, easy to use. Allows you to quickly add fields during the checkout pages that would otherwise cost money and time to have a coder do it for you. 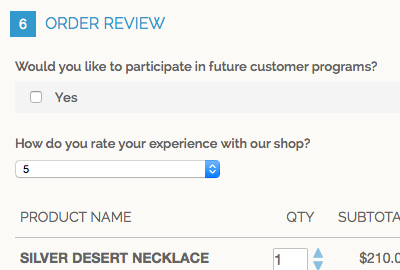 Example: we use it to add a "Order Comment" section so the customer can specify additional information for the order. CONS: The only con we found is that even though the fields are stored in Magento there is no way to report on the fields. Example: we ask the customer where they heard about us. The answer shows up on the order information but there is no tool to generate a report for that captured data. We have become what we wanted.